Environmentally friendly packaging design can give businesses a competitive advantage on the market. Eco-friendly business practices demonstrate compassion and awareness, which can be a persuasive factor in helping customers choose between you and the competition. In addition, companies who invest in green packaging also stand to save money in the form of shipping costs, material costs, and reduced waste. 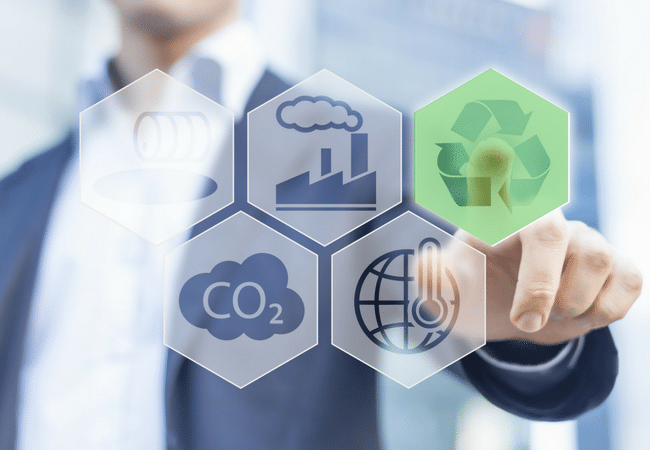 Studies by the Carbon Disclosure Project (CDP) show that companies that actively seek out ways to make their operations more eco-friendly see their ROI increase by as much as 18% over companies not making these efforts. The most straightforward strategy for going green is to streamline your packaging design. Eliminating excess packaging makes shipments lighter while simultaneously allowing greater quantities of product to fit on pallets, shipping containers, and, most importantly, retail shelves. The Coca Cola Company reported that after introducing a new “lightweight” packaging program, they were able to save an estimated $180 million over the course of two years. Packaging still needs to protect your product, of course, but reducing packaging waste can be as simple as removing unnecessary material from the process. In other cases, a change of material may be required. In one example our packaging advisors helped a pickle producer seeking to switch from glass jars to a flexible pouch. We worked with their design team to create a pouch that would be appealing, protective, and cost effective. The new design helped with retail visibility and drastically reduced shipping costs. Obtaining materials from sustainable sources in an important part of improving your company’s sustainability index score. The best options are materials that are post-consumer recycled. Many local recycling programs have more material than they can handle and are happy to have it go to good use—such as being reused to ship your products. This means companies who are willing to use recycled materials can find them in abundance without having to worry about the cost. More than ever, retailers, manufacturers, growers, and producers are finding ways to recycle. The most common way to incorporate recycling in the production process has been the increasing trend of using reusable transport packaging over corrugated cardboard. Doing so provides more secure shipping, lowers supply chain systems cost, and reduces environmental impact. Some of the world’s most successful companies, like Walmart, have turned to environmentally-friendly packaging as a means of both reducing material and shipping cost and reducing damaged product loss. Going green is good for the planet, but it will also be good for your business. If you are seeking ways to reduce your company’s environmental footprint and increase your ROI this year, contact the professional packaging advisors at Industrial Packaging. We can work with your design team to create a packaging solution that will reduce waste, minimize shipping costs, and increase profit margins.